The club was formed in 1953 and was originally known as Croydon Amateurs, changing to their current name in 1973. They started out in the Surrey Senior League, finishing as runners-up three times in ten seasons. After a single season in the Spartan League, where they won the title, they joined the Athenian League in 1964. After finishing as champions in 1966, plus a couple more runners-up spots, they joined the Isthmian League in 1974. Starting out in the second tier, they were runners-up behind Tilbury, earning promotion to what was soon to be called the Premier Division. Croydon would remain here until 1989, with a record finish of 4th in 1986. This was when the league sat at step 2 of the non-league pyramid and remains Croydon's record high finish. Fortunes soon declined however and by 1989, they were relegated to Division 1. This was the start of a lean spell for the club and they suffered a further relegation in 1994. They recovered, winning promotion back up in 1996 as runners-up to Canvey Island. 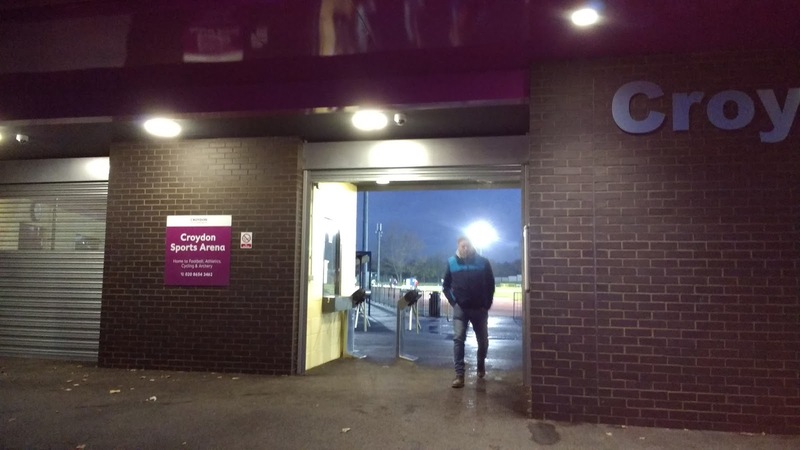 After finishing as champions at the turn of the century, Croydon would enjoy two final seasons in the Isthmian Premier before relegation followed in 2002. Again, it prompted a difficult spell and they were relegated again in 2005. This was a time of reorganisation of the pyramid and the club would have spells in the Combined Counties and Kent (later renamed Southern Counties East) leagues at step 5 of non-league football. Their best finish in recent times came in 2007 with a 3rd placed finish in the Kent League. Last season Croydon finished 11th in the Southern Counties Premier, their best finish since 2009. They are doing even better this season, sitting in 5th at the time of the game. In the FA Cup, Croydon enjoyed their best run during the 1979/80 season. After beating Bexhill Town, Ashford Town, Bognor Regis Town and Leatherhead, they faced fellow Isthmian League side Wycombe Wanderers in the 1st Round. They comfortably won 3-0 and went on to play Millwall in the 2nd Round. Demand for tickets was so great that the game was switched to Crystal Palace and Croydon gained a heroic 1-1 draw in front of their record attendance of 9,809. They'd finally bow out in the replay, losing an exciting and narrow game 3-2. Other runs in the national cup competitions have seen them reach the FA Amateur Cup 3rd Round, the FA Trophy 2nd Round (three times) and the FA Vase 4th Round (three times). Local cup wins include the Isthmian Full Members Cup in 2000, the London Senior Cup in 2002, the Surrey Senior Cup in 1982, the Kent League Cup and Kent Challenge Shield in 2009 and three Surrey Senior League Cups. Croydon are nicknamed 'The Trams' owing to the proximity of their ground to the local tram stop. Record attendance at the Arena is 1600, achieved for a 1954 Surrey League Cup Final game against Dorking. Their best ever win was 11-0 as they defeated Banstead Athletic in a Surrey Senior Cup game. 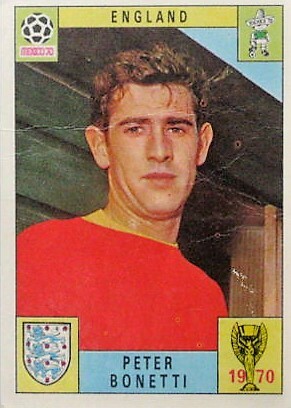 The most notable player to play for Croydon was Peter Bonetti, the future England goalkeeper playing 5 games for the club as a youngster whilst on loan from Chelsea. Croydon had received modern press attention for being the centre for UK Visas and immigration, although it has had plenty of famous Brits born there. These include football manager Roy Hodgson, footballer Jason Puncheon and authors D.H Lawrence and Malcolm Muggeridge. 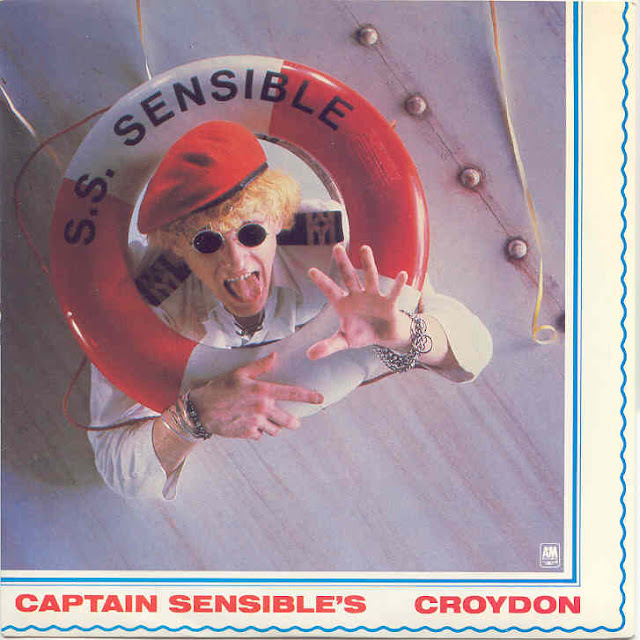 Musically, Kirsty McColl, Katie Melua, Amy Winehouse, Captain Sensible and Stormsy also have connections with the town. As part of my attempt to cut down on driving, I was always going to be doing a game on the train on this Saturday. Originally, the choice was going to be Crockenhill, though the 2 PM kick off put me off as a day out in London was as much a part of the day as the football. 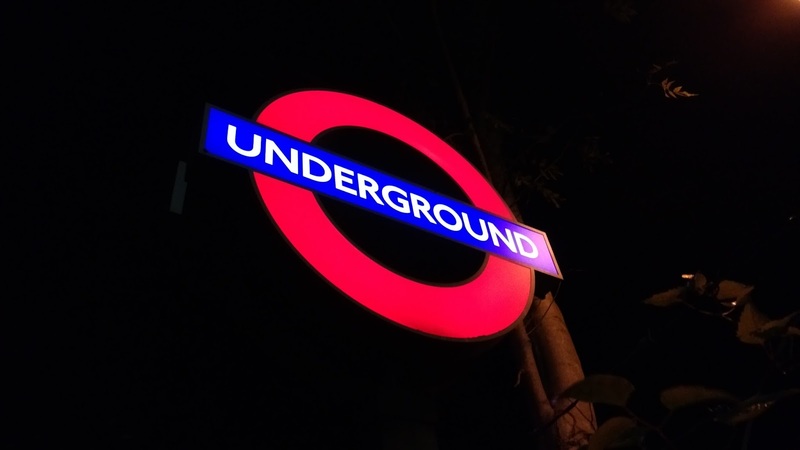 With it being right on the outskirts of the travelcard zone, I decided to save it for another day, especially as fellow hopper Anwar was also going to Croydon. That particular ground had a few downsides, not least the running track around the pitch. It was also one of the pricier at step 5, costing £7 plus £2 for the programme, but with an excellent town centre nearby and me able to easily visit one of my favourite haunts in central London beforehand, I decided to go for it. Their Twitter was also very active compared to Crockenhill's, meaning that I'd be kept informed of any changes and things like team news and goalscorers. On the Thursday night, I spent around three hours researching Croydon's history, although, with the whole internet and especially Wikipedia at your fingertips, it's so easy to get distracted and read plenty of random and unrelated stuff. I'd been considering going to a game on Friday night too, but with me having an expensive time recently, as well as FA Cup football on the TV, I decided against a trip to Oakwood near Crawley, that after Anwar had rejected the offer of Tuffley Rovers v Oxford City in the Hellenic Premier. In the end, Milton Keynes triumphed 4-0 against Hyde, much to the chagrin of football fans everywhere. I had a few drinks but didn't go mad and I was in bed by 10.30. As I result, I woke early at 6ish, but still had a good sleep. After catching up on my YouTube subs, I played Football Manager for the first time since July to pass some time. Typically, after being dry all week, while people were stuck in work, the poxy weather decided to rain, so I'd be needing my wet weather gear. I'd decided to go from Chalfont rather than Amersham as it had a slightly better range of connections. I left at 9.40 and 20 minutes later was parked up in Chalfont. After getting a paper, I went to the station, waiting around 15 minutes for a train. After a change at Finchley Road, I got to Borough Market at 11.30. 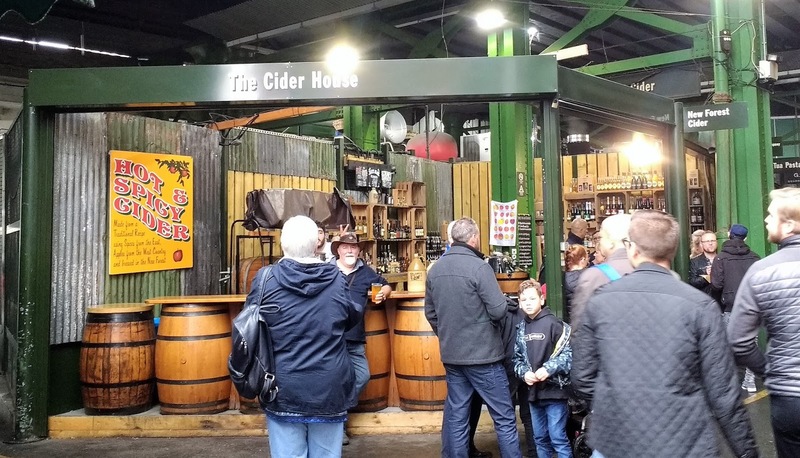 I'd come here to visit the New Forest cider stall, which was as superb as ever. I started off with a pint of Willie Gunn which was terrific for such a low percentage cider. Then it was a small bottle of Local Fox before I tried a pint of their own sweet cider to complete the set. It was 12.56 by the time I got the train to East Croydon, later than I’d hoped, but I was in good spirits. I got to Croydon around half an hour later and fairly peckish. McDonald's did the trick, a jerk chicken burger with fries for about £5.50. After a look round a couple of shops, I caught the tram to the ground, the journey giving me time to catch up with things online. I got to the ground at 2.30 and was pleased to get entry for £3.50 thanks to an offer for EFL Season ticket holders. I met Anwar in the stand and we had a good chat while we waited for kick off. The view from the stand was not bad, with the elevation compensating for the distance from the pitch. 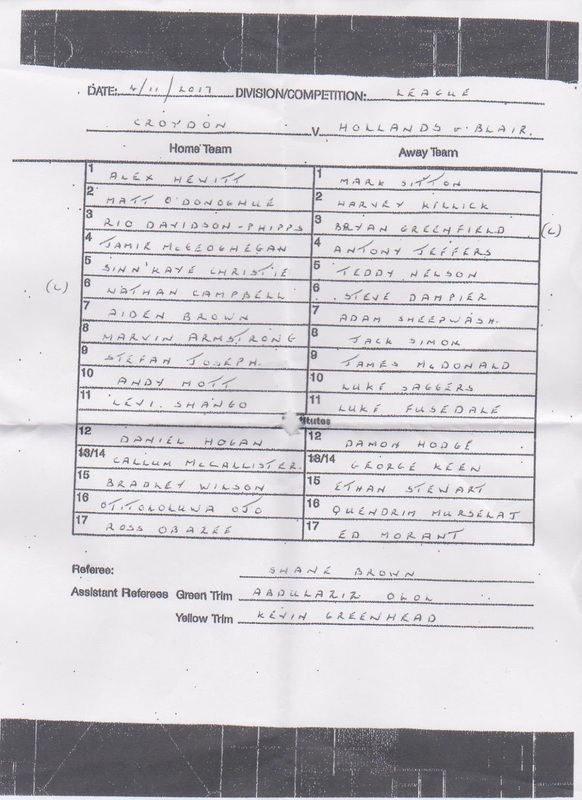 Croydon started the strongest and took the lead after 20 minutes when a ball was played across the six-yard box and rifled into the roof of the net by Andy Mott. Up to this point, Hollands & Blair had offered little, but they equalised on 27 minutes when a ball was played across the box and a low shot was put away from 12 yards. 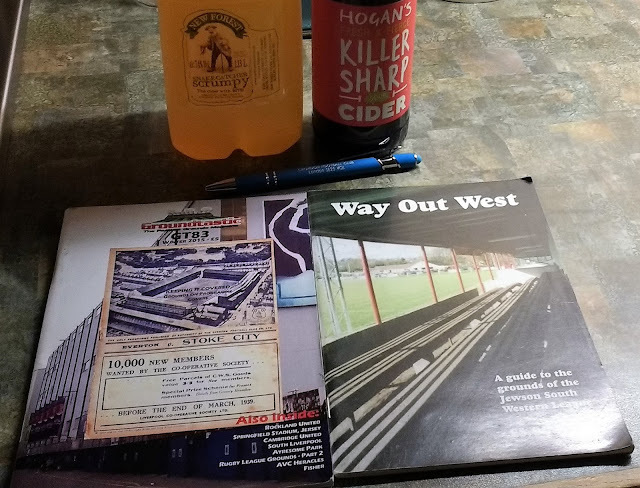 At halftime I visited the club shop, it was a good on for hoppers and I bought a couple of Groundtastic back issues and a Croydon FC pen for £2 each. The hosts had had much the better of the first half and they took the lead a minute into the second period. It was a simple finish from inside the area that regained the lead and from there they never looked back. It was 3-1 on 55 minutes, this time Jamie McGeohegan hit a curling low free-kick into the bottom right-hand corner. A few minutes later, he repeated the trick to make the game safe at 4-1. Hollands & Blair staged a brief resurgence and scored the best goal of the afternoon on 70 minutes with a shot that flew in the top left-hand corner. The hosts restored their three-goal lead on 72 minutes, a shot hit the bar and a Croydon man followed up with a header from a few yards out. 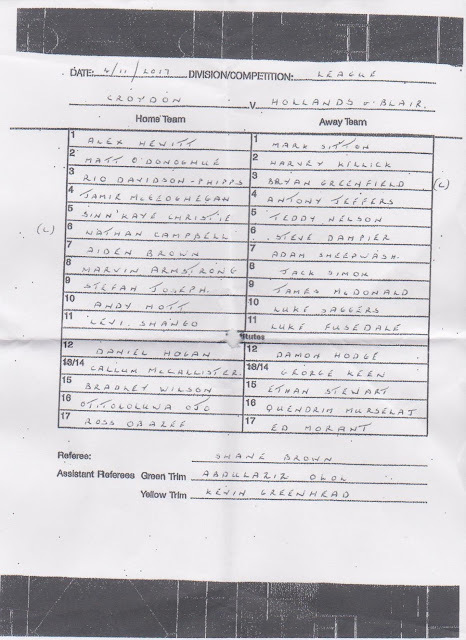 Hollands and Blair then had a header disallowed for offside before Croydon wrapped up the game, making it 6-2 a minute from time when Stefan Joseph headed in from a corner. We got away in good time after the game, with a tram arriving within seconds of us reaching the platform. From East Croydon, we went to a very busy Victoria and after a couple of changes, we were at Marylebone, ready to get our train home. Again we had barely any wait, and happily, I was able to get the same train home as Anwar. He stayed on until Aylesbury, with me getting off at Chalfont and Latimer. I was back by 6.30, getting to my car 5 minutes later. I got back home at 7, typing my blog while I listened to the football phone-ins on Radio 5 and TalkSPORT. After that, I caught up with YouTube and chatted online until Match Of The Day came on. The Croydon Sports Arena is a ground that I visited before to take pictures, a lot of these come from my London football ground tour on Tuesday 23rd January 2006, prior to Wycombe's League Cup semi-final game at Chelsea. The most notable part is the running track, which spoils the view somewhat, but aside from that, it's a fairly decent stadium for athletics fans. There's a sizable main stand, 450 in capacity and this is elevated slightly to improve the view which is not helped by a large space and floodlight pylons in front of it. Over the other side is standing cover for around the same amount, whilst extensive terracing gives the ground a capacity of 8,000. There's not much in the immediate vicinity of the ground, though the town centre is a short tram ride away. This has a number of takeaways in it, as well as three Wetherspoons, so you will never go thirsty or hungry. There are also a number of cheap 'Poundland style' shops and retro computer games shops, which suit me down to the ground. Back at the ground, there is a basic tea bar, as well as a cosy clubhouse although I didn't purchase anything from either. There's also a good club shop, a rarity at this level.